You have been hardened by the forge of war. You are a lord of the battlefield, studying the art of combat to shape yourself into a living weapon! Fighters know how to use the best weapons and armor! 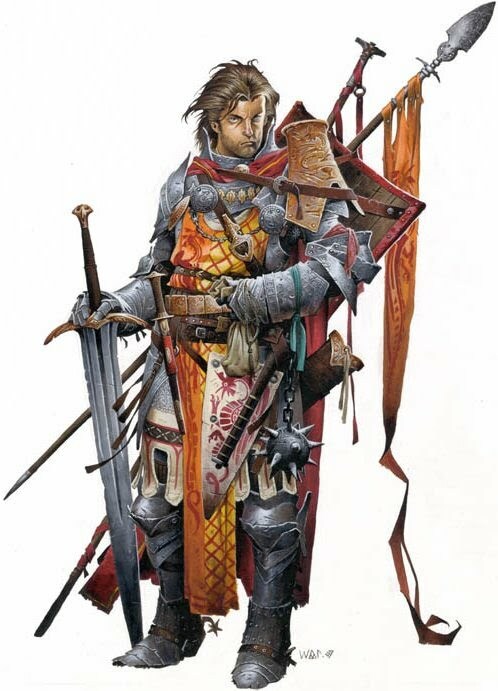 In Section E of your character sheet, check shields, light armor, medium armor, heavy armor, simple weapons, and martial weapons. You’ll learn more about armor and weapons later. As a 1st level fighter, you can choose to take Weapon Focus or else select one Combat Feat (from the list under 2nd-level fighter Class Features). Choose one type of weapon from the list below. Write weapon focus and the name of your chosen weapon in Section I of your character sheet. When you make an attack roll with that type of weapon, add +1 to your Attack Bonus (Section G). A battleaxe can be used one-handed or two-handed for devastating critical hits. A longsword is a reliable weapon used by adventurers, soldiers, and city guards. A sturdy warhammer is great for crushing skulls or smashing skeletons. A shortbow is quick and deadly, and small enough that you can use it on horseback. If you don’t want to pick one of the weapons shown here, check out the other weapons in the Equipment section. BRAVERY: Write Bravery under your class features (Section F). You get a +1 bonus on all fear saves. Blind-Fight, Cleave, Combat Expertise, Deadly Aim, Dodge, Far Shot, Great Cleave, Point-Blank Shot, Power Attack, Precise Shot, Quick Draw, Rapid Reload, Rapid Shot, Shield Focus, Step Up, Weapon Finesse, Weapon Focus. You must meet any prerequisites for the feat you choose. Write this feat in Section I.
ARMOR TRAINING: Fighters can hustle! You can move at full speed in medium armor (like chainmail, hide armor, and scale mail). Heavy armor still slows you down, though! WEAPON SPECIALIZATION: Fighters can deal extra damage with their chosen weapon! You add +2 damage whenever you make a damage roll with the Weapon Focus weapon you chose at 1st level! In Section G, add +2 to that weapon’s Damage. WEAPON TRAINING: Fighters improve their skill with similar kinds of weapons. Pick one group of weapon from the Weapon Groups below. You get a +1 bonus on attack and damage rolls with all weapons in that group! Remember to update your Attack Bonus and Damage for these weapons in Section G of your character sheet.